I find most wines from Mendoza to be at least a good bargain and this one certainly follows suit for only $10.99 at Costco. This is a nice red blend, consisting of 45% Malbec, 35% Syrah, and 20% Cabernet Sauvignon. And it’s an interesting combo. The first thing that hit me, almost on the pour, was the smoky/wood. There’s a big cigar cedar element to this wine, which is ok with me if the flavor can pull through, which it did. Being an ’08 it’s had a little time to chill out. There’s a nice blue berry component, a little tobacco; some pepper on the finish, a bit chewy. Overall, I’m going to say it’s a nice wine for the money. 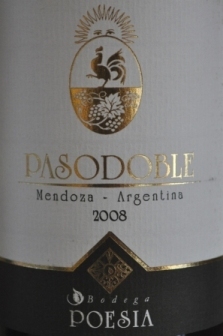 Certainly a little different package from Mendoza with the blended varietals, but I would recommend it, especially at this price. You could enjoy this wine with a lot of different cuisine.